The wood pallet recycling has rendered new dimensions and heights to the wood work, it has transformed the lives of many including me. Just in a very minor time it has touched the new horizons of fame and trust by the masses as it beholds many potential benefits which are known to all of the wood pallet crafters who have made it an integral part of their lives. Same passion could be observed in our exploration of some ever new wooden pallet recycled furniture items. 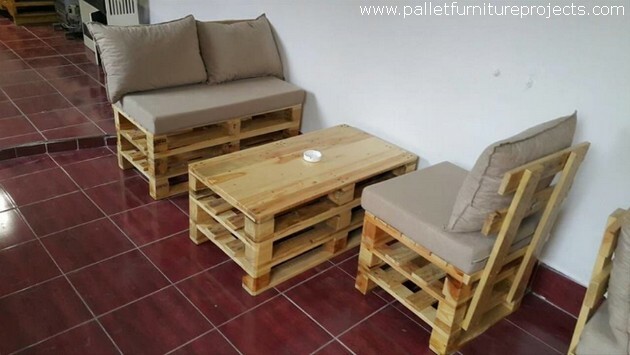 Like here we bring a wood pallet furniture set that is simple in outlook, yet very awesome. The furniture might look initially as if it is related to some commercial spot but it isn’t so in actual. We have made it with pure intentions to use it inside the house. Though we have done it with a certain approach that we wanted to create an atmosphere inside the house similar to some café or restaurant. 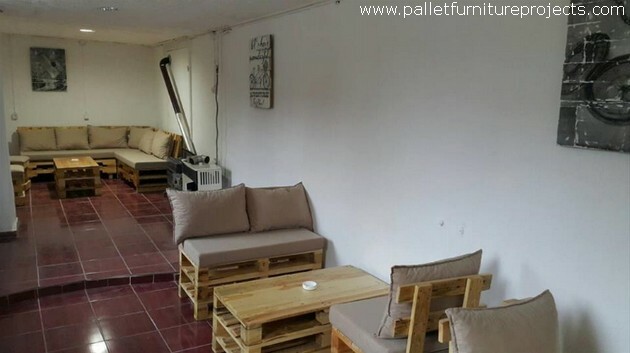 The residents of the house usually try some newly explored recipes sitting on these wooden pallet couches and tables. We are going to have a glimpse of this furniture range in the coming graphics. This would give you guys a broader look into the usability of the shipping pallets. Do you see this large hall? This is a portion of a well constructed house that was built for a grand family. We have brought here a grand L shaped wood pallet upcycled couch along with a decent coffee table that is also multi tiered. 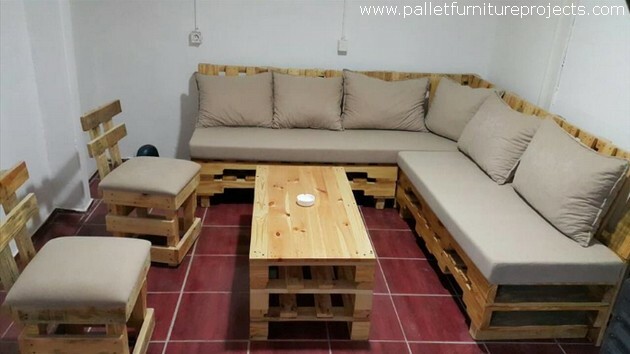 While in the front we see a couple of small wooden pallet couches having sitting space of couples on each, while the centre table is also reasonably matching with the rest of the wood pallet furniture items. No doubt we have had to travel down town in the search of these fresh and fine shipping pallets.